Today's gift is like God's design for His church. For this LO I used generous gifts from several different designers combined with my own. Each element is the product of the gifting God has given each designer and together it produces a richer, more unique end result than had only one of us made it all. In His church, the Body of Christ, each member has his own unique gift from God and service contribute to the whole. When we all come together as we should serving God through our local fellowship, the results are far greater and more marvelous than if any one of us tried to do it all ourselves. Each person is necessary and their contributions, no matter how mundane they may seem to that person, is immeasurably important to the whole. "14For the body is not one member, but many. 15If the foot says, "Because I am not a hand, I am not a part of the body," it is not for this reason any the less a part of the body. 16And if the ear says, "Because I am not an eye, I am not a part of the body," it is not for this reason any the less a part of the body. 17If the whole body were an eye, where would the hearing be? If the whole were hearing, where would the sense of smell be? 18But now God has placed the members, each one of them, in the body, just as He desired. 19If they were all one member, where would the body be? 20But now there are many members, but one body. 21And the eye cannot say to the hand, "I have no need of you"; or again the head to the feet, "I have no need of you." 25so that there may be no division in the body, but that the members may have the same care for one another. 26And if one member suffers, all the members suffer with it; if one member is honored, all the members rejoice with it. Haiti Earthquake Relief Update: One kind person has donated $10 and received the new MEGA KIT My Woman's Heart with over 275 pieces. To join this worthy effort, click the "donate" button at the top of the blog. Now your gift for today...I know there have been other tree templates, but if you like my twist to it, today's your lucky day! 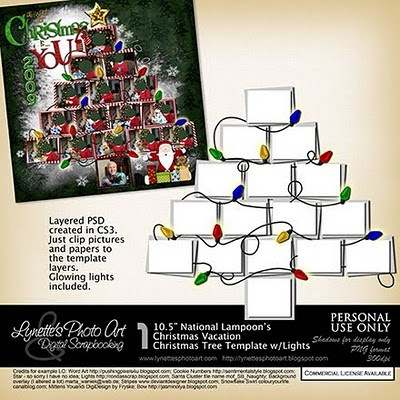 This is my National Lampoon’s Christmas Vacation Christmas Tree Template w/Lights! How fun is this! I made a layout of someone opening a present and used a lot of gifts from others along with my own work. I liked it so well I thought you might like the template. I would happily have made it a QP, but other's TOU won't allow. The lights allow so the template includes the glowing light bulbs on my cords and sockets to give you a head start! It's a layered .psd created in CS3 so just clip your pictures and papers to the template layers. Only the lights layer has shadows included. Credits are below so you can go grab all the rest of the elements and thanks to all the designers! It's a big file so I won't be offering this long due to limited on line storage so go grab it now and have fun! Love this! Can't wait to use it with my next project!! TFS! Thank you for sharing your frame cluster. I'm a beginner and this is going to be great for me! Thank you so much! Wonderful template! Thanks so much! good template, but an insensitive password. please respect other beliefs as much as I respect yours. Hi Lynette, this is absolutely fantastic! Seems to be a problem with the download link though. I'll check back again later, love your stuff ... today is the first day I've found your blog. Awesome work! What a very good idea to create a kit for Haïti. I took part in this huge worldwide surge of solidarity in an other way here. 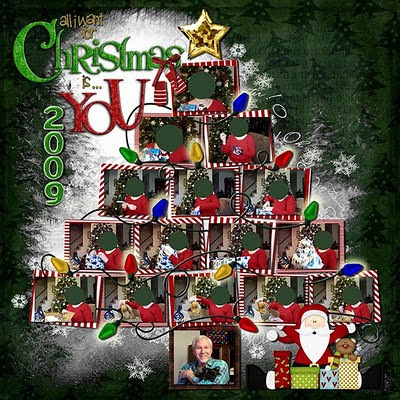 Hey Lynette - I LOVE this template, but the download link is no longer valid and I don't see it on your Paypal store page? Is it available anywhere?